Your playing with "this and that" has eventuated into the most gorgeous of tote bags! It is a vision splendid, Linda. The graphic is so pretty....'tis perfect. You do fashion the prettiest of pretties! Ooh Linda, I simply love this tote, too. I really, really want to try this technique. You embellished the design perfectly with your pretty lace and trims. 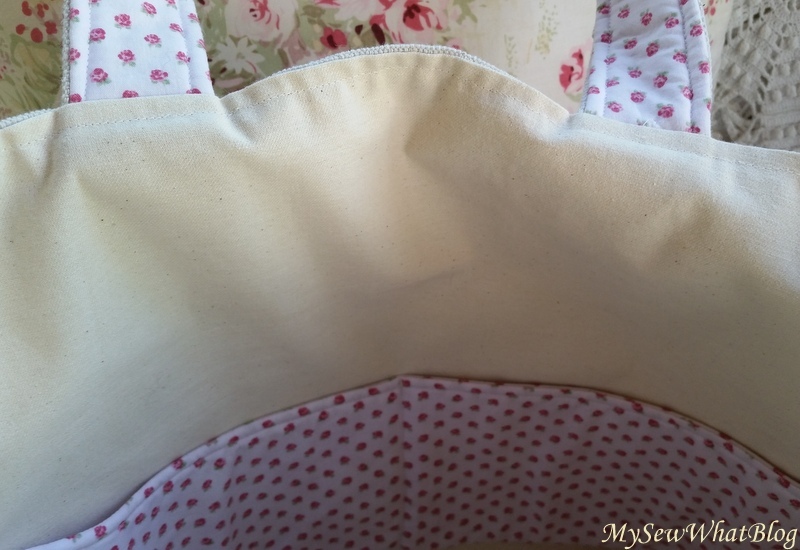 I also love the print that you chose for the underside of the handles and the lining. Great job!!! 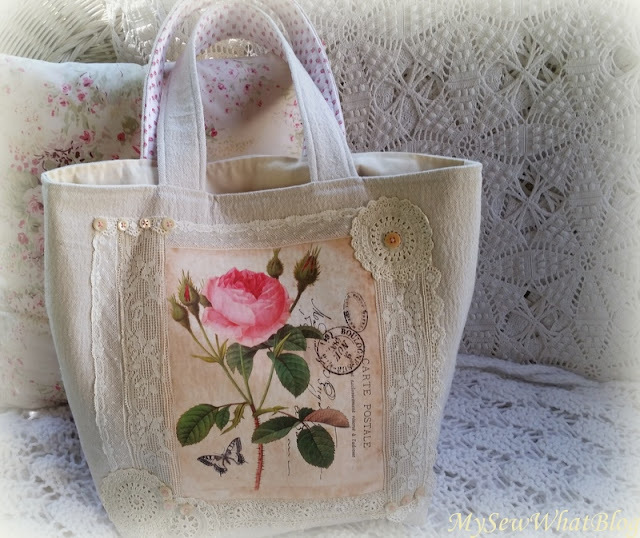 Hi Linda, I adore your gorgeous tote. So beautiful with the pretty rose and all the lovely details you add. The lining is so pretty too and enhances the graphic. Your are such a talent and I love everything you create. 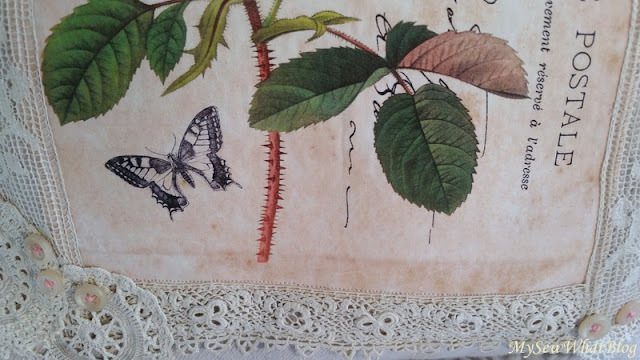 I can just see you playing with your stash of lace trying to find the right piece in order for your creation to come out just as you in-visioned, and beautiful it is. The rose is stunning, quite eye catching I must say, and goes nicely with the lining. So nice to come for a visit and see your loveliness, Linda. 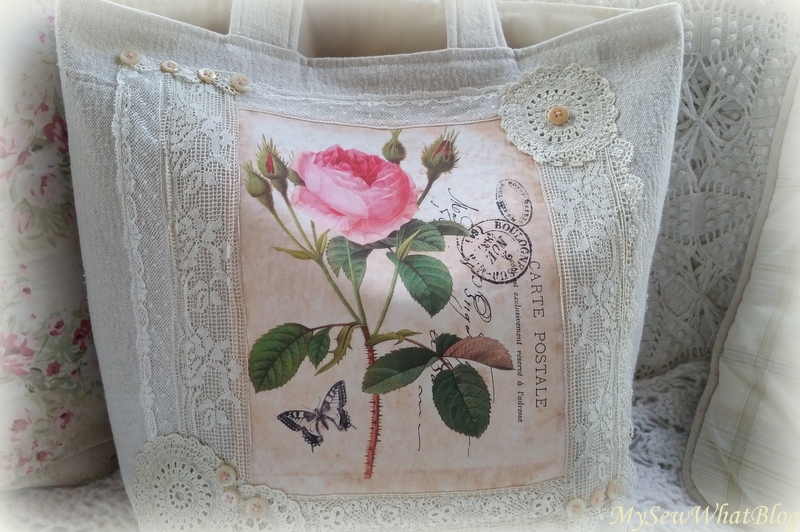 I'm so charmed by this bag of yours, dearest Linda, this is truly a work of art which won my heart, thank you for sharing it with us ! Oh Linda....I agree with Dany - I, too, am charmed by this bag :) Your creations are always, always, always gorgeous, but this one is my FAVORITE! The rose, the lace, the buttons, everything is perfect. Beautiful job, my friend. I love it, but who wouldn't?! It's so beautiful and charming. You must be very proud of the amazing work you do Linda! What a pretty tote! Thank you so very much for sharing this wonderful post at Thoughts of Home on Thursday. Linda, this is lovely. I enjoy totes so much. Thank you for joining Thoughts of Home. I love all of your totes, but this is my all time favorite!! Any woman would enjoy having this beauty. Truly all of your sewn pieces are works of art, that most of us do not have the talent to make. I am so pleased that you shared this with us at TOHOT. Sharing this one too, my sweet friend. Oh my I will have to say I love this one even more, Love the rose graphic and your layering of lace is just lovely and the buttons add a lovely touch to it also, Gorgeous work!! Oh, wow! This is such a pretty project. I love the graphics you used and the tiny rose print for the liner!!! 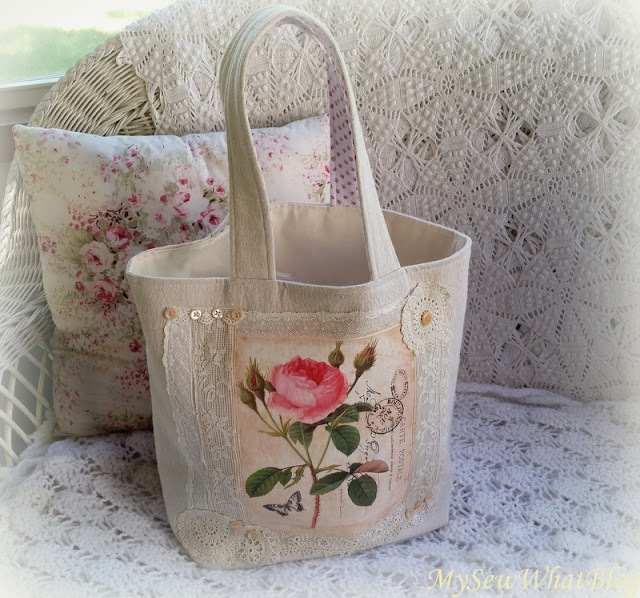 Your rose tote bag is so pretty and feminine. The time you took to choose the lace sure payed off. Thank you for sharing at Vintage Charm. That is absolutely lovely!!! 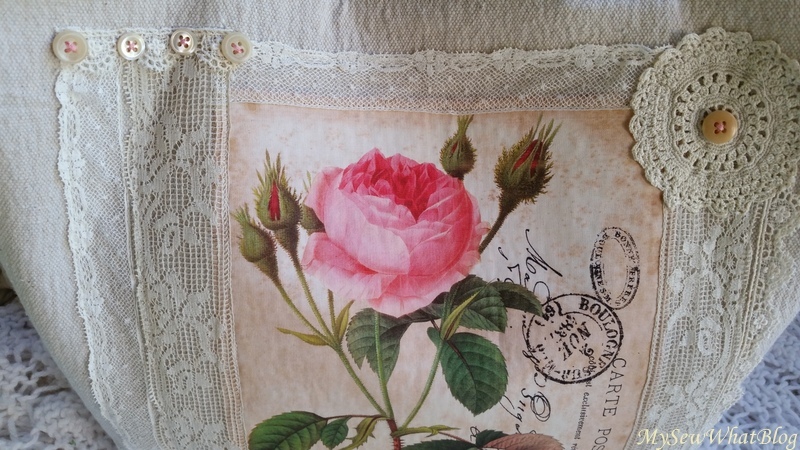 And the pillow behind it is gorgeous, too. I am an avid sewer so I know how much work goes into there things. Well done.